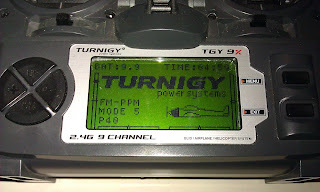 Parts of this tutorial come from: http://rcheli-blog.blogspot.com/p/turnigy-9ch-setup.html, the source I used to get my heli setup properly. 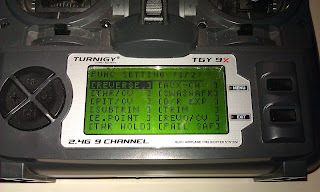 These settings were for a mode 2 receiver while I'm using mode 1 though and some information was missing/unclear. At this point you should have your heli build complete. That is the servo's are in place and the ballinks installed. For installation of the ballinks it's important that the lengths of the manual were respected. Don't put the servo arms on the servo's yet. For this the servo's need to be centered. Don't connect the motor to the esc yet. 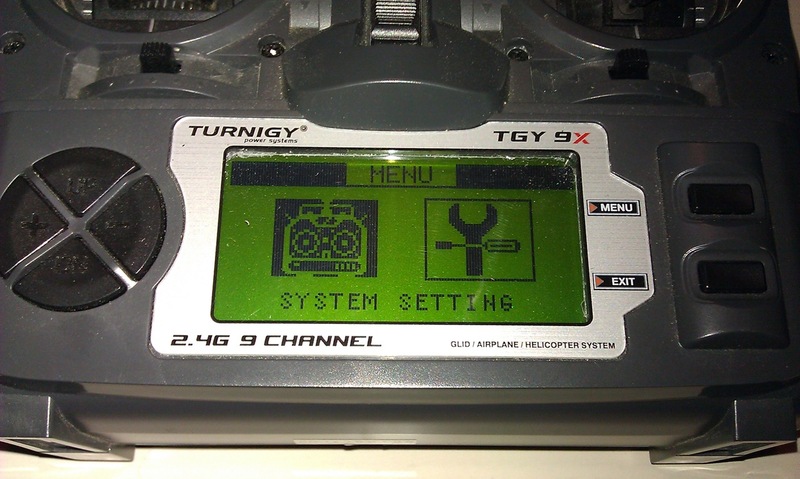 You'll have to throttle up to configure everything and you don't want to see your heli take off before this is completed. The throttle cut function is inactive by default so don't rely on that either. 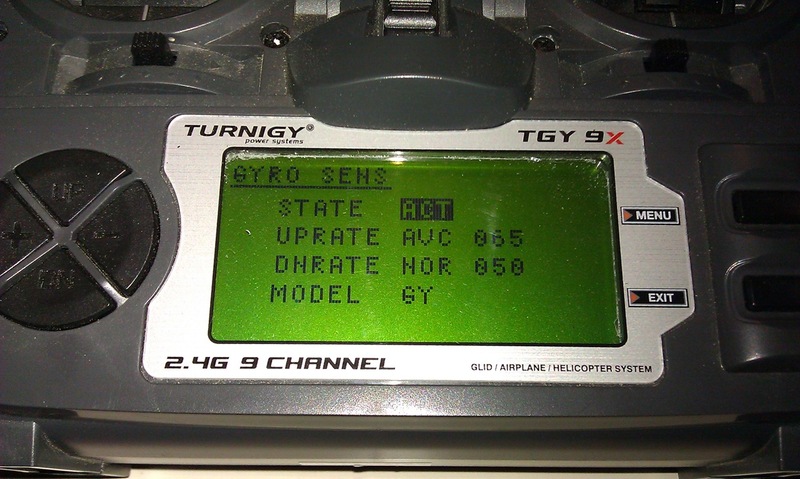 You might want to wait with the installation of your main rotor blades until you verified everything is working correctly. 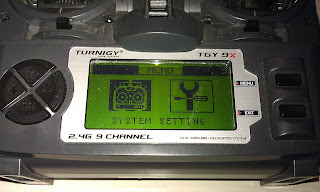 If you get a warning SWITCH ERROR you need to set all switches to default before you can boot up your tx. I am assuming that you know the basic menus and how to get around them, have a play first and get familiar first before jumping right in. Also keep in mind that the sticks respond according to the mode you have set. Most commons modes are MODE1 and MODE2. 1. 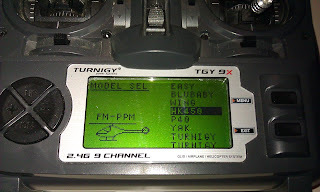 Setup a new model memory, select HELI then click the menu button to select. 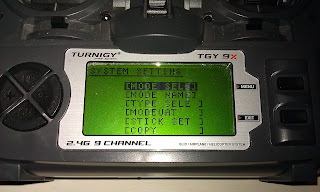 (quick clicks of the menu button select, long ones reset the amount). Long press MENU to get into menu. Short press menu again to select SYSTEM. Select any memory slot you want. Confirm with MENU. EXIT will return also but without updating your changes. Back on this screen select MODE NAME to update the name of this memory slot. 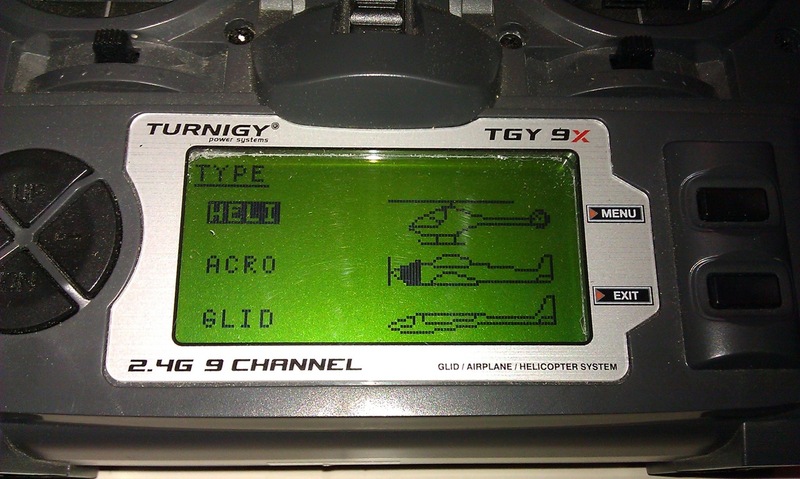 After updating you get back to this screen where you can select TYPE SELE to select the HELI type. 2. 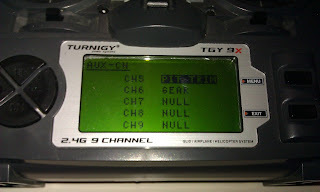 After selecting HELI it gives you the heli menu, choose Heli 3-1 which Is for 120 degree CCPM, this is the system of three servos that the TRex and many others use. 3. Once selected exit back to the System setting menu and then check that under the STICK SET heading what mode is enabled. Be careful changing the mode when an ESC is already connected. If you change the system will ask if you want to reverse throttle. MENU corresponds to YES while EXT to NO. If you get confused at this point it might go to full throttle in a blink of an eye!! 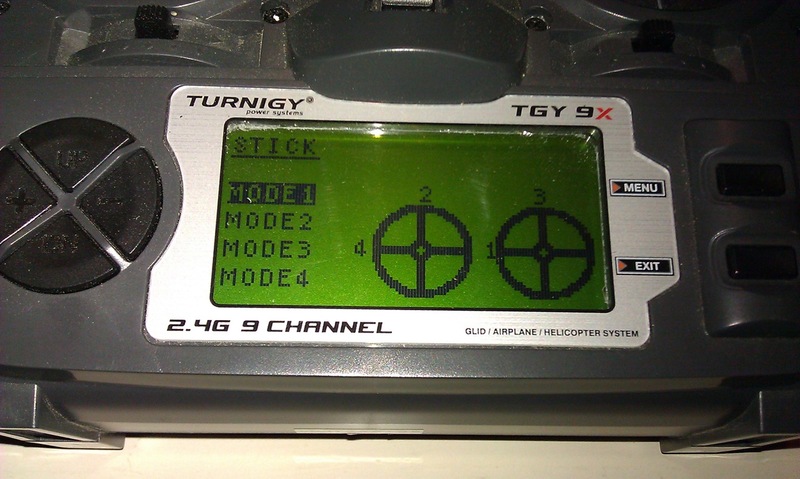 Here you can choose the MODE you prefer with a clear graphic showing what stick is on what channel. 4. 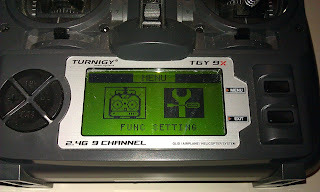 Now exit back out and now go into FUNC SETTING menus. 5. Go to THR HOLD in the function setting menu, at the state option change INH (inhibit) to ACT (active) a line of text will appear above saying THRO CUT (OFF) flick the switch at the top left back of the unit, this will turn it to (ON). Throttle hold is for safety it allows the pitch etc to be checked without the motor turning on. Also useful for general safety at the field. 6. 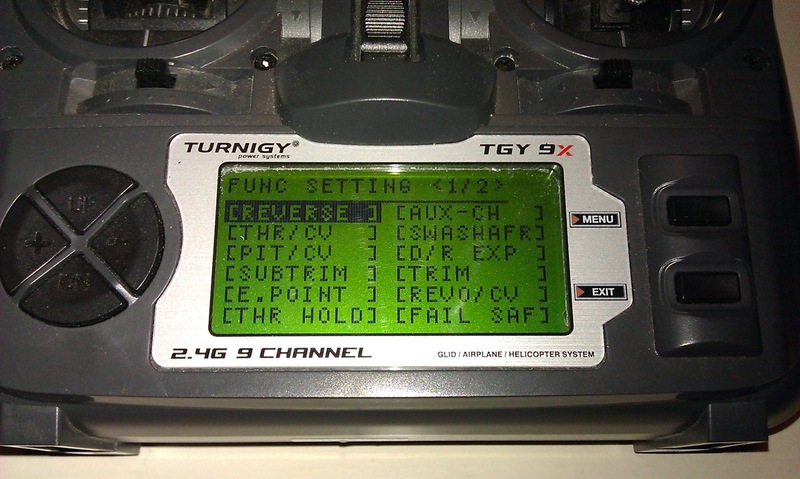 Back to FUNC SETTING menu. Under AUX-CH leave all as is. You 'll see that the gyro sensitivity is on channel 5 which is by default set on the GEAR function. That is the front switch on the right shoulder. The pitch, channel 6 is set to the trimmer on the left. The labels on the tx correspond to these. 7. Now that all the switches and knobs are assigned activate the throttle cut function and connect all the servo's. To work out which servo goes where is easy, elevator is channel 2 on the receiver, this is the servo at the rear of heli just behind the main rotor shaft. 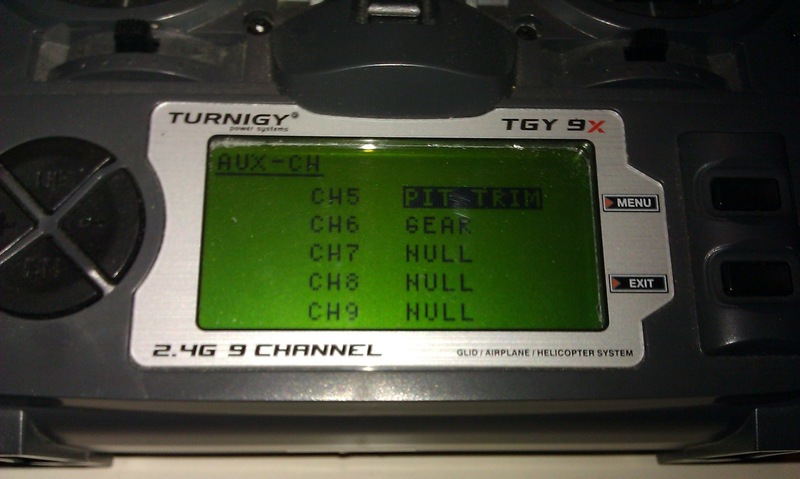 The other two servos plug into channel 6 (pitch) and channel 1 is the aileron doesn’t matter which way round these two are. 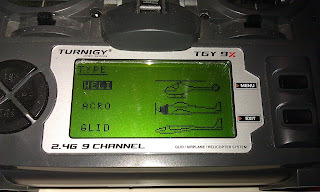 Your gyro goes in channel 4 (rudder) and the gyro adjustment goes in channel 5 (gear), esc goes into channel 3 (throttle). Once the servo's are connected they are powered up and center. This is an important step to do before you connect the ballinks from the servo's to the swashplate. Center all sticks, also throttle. Double check that your esc is not yet connected to the motor. Now put all the servo arms on the servo's in a 90° position. They should all be horizontal (except for tail). 8. At this point you can check if any servo needs to be reversed. 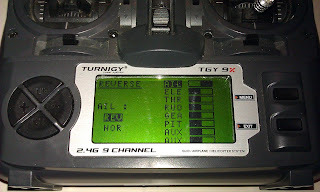 From the FUNC SETTING menu you go to REVERSE where all channels are listed. The reverse function is needed to set the direction of the servo's in relation of each other. Be very careful with the THR reversing option since that would just hace you motor go full throttle!! The 2 side servo's (pitch PIT and aileron AIL) should move in the opposite direction when left/rifht cyclic command is given. 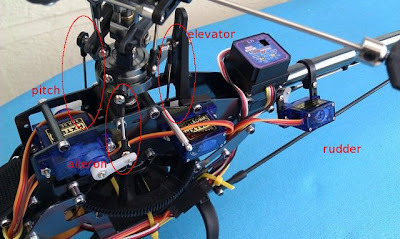 The single centered servo directly behind the main shaft (elevator ELE) needs to move opposite from the 2 front servo's while these 2 front servo's move together. Only reverse the elevator (ELE) servo at this point, leave pitch and aileron as is since we will fix that in the next step using the mix setup. For my setup I had to reverse the aileron channel. Depending on how you want the tail to react you might want to reverse the rudder channel also. 9. 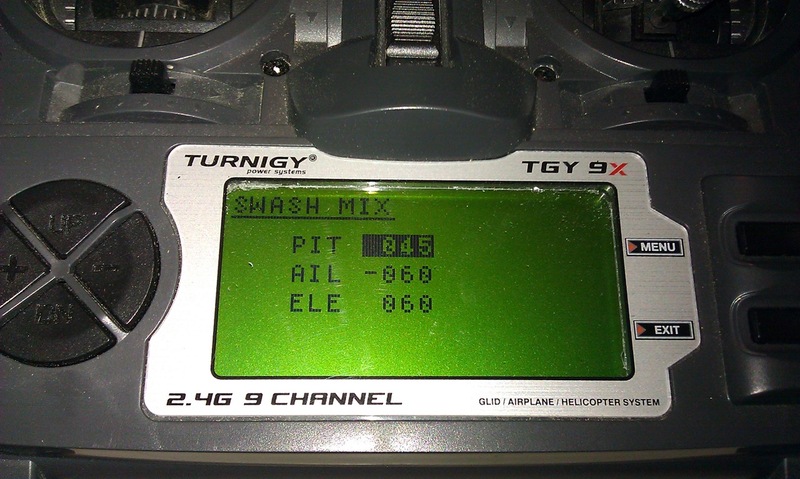 SWASHAFR is the amount of mix each channel gives in 120 degree CCPM. Use this when a servo is not moving in the right direction in relation to the heli. 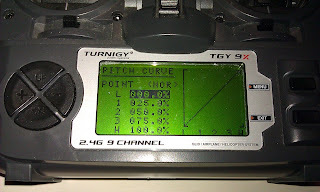 Or if you have trouble reaching 10-11 degrees positive and negative pitch you can change the amount of pitch in here to a higher value If required, your pitch curves then set the limits. 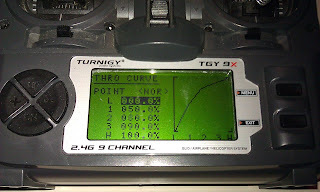 On throttle up all servo's should move up while on throttle down they should move the swashplate leveled downwards. If any servo is not moving in the correct direction you need to switch the sign only. For instance 50% would become -50%. If the complete swash is moving in the wrong direction you need to update the sign on the PITCH channel. On elevator up/down the aft servo moves up/down while the 2 front servo's move together in the opposite direction. The swash needs to tilt in the direction of flight. That is forward on stick moving up and vice versa. On aileron left/right the aft servo stays in place while the front servo's move in opposite direction. Again the swash needs to point down into the direction of movement. For my setup I ended up with PIT 45, AIL -60 and ELE 60. 10. Back to FUNC SETTING menu. 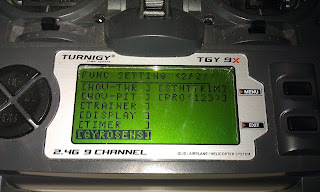 On the second function setting page you need to go into GYROSENS and turn it on, switch from INH to ACT. Scroll to model and change to GY if you have a GY401 futaba or clone, then scroll up to the UPRATE and DNRATE, if you change from NOR 100 by clicking the – button you will get to 0 and then back up to 100 but you’ll notice that NOR changes to AVC, this is your gain for AVCS or heading hold mode. Now the switch is the front top right shoulder switch, this can be used to flick between two gain settings, or two modes of your gyro depending how you set it up. Mine is setup for GY mode, UPRATE AVC 75%, DNRATE NOR 60% which lets me switch between heading hold and rate mode easily. 11. Once the above are setup you can move onto your pitch and throttle curves, these are easy enough to setup and for detailed information on these please refer to Finless Bob Whites videos as he explains it well. Both can be found in the FUNC SETTINGS menus. 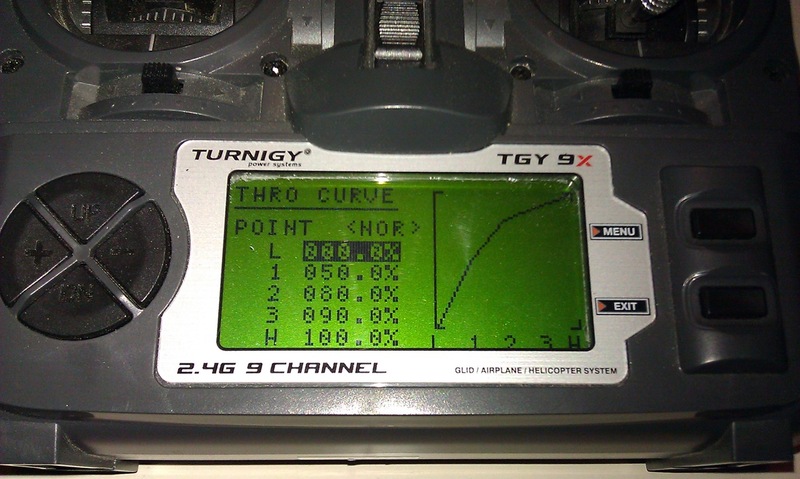 A good starting point for throttle curve (THRO CURVE) is: 0, 50, 80, 90, 100. 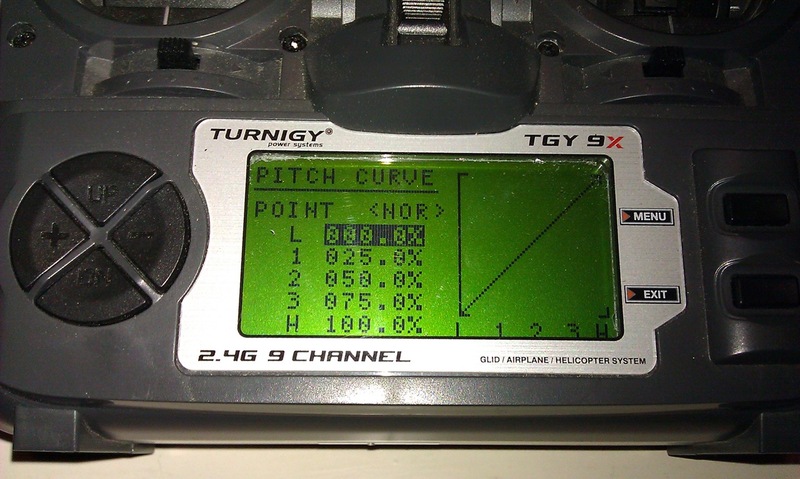 And for PITCH CURVE: 0, 25, 50, 75, 100. 12. SUBTRIM is also handy to get your ccpm servos all setup level, but you will learn this from Finless’ videos anyway. 13. ENDPOINTS are also useful to get rid of CCPM interations, again please refer Finless’ videos for more. That’s it, easy as but its also easy to pick the wrong setting if you don’t know what you are doing and this can lead you astray! This is an important step to do before you connect the ballinks from the servo's to the swashplate. 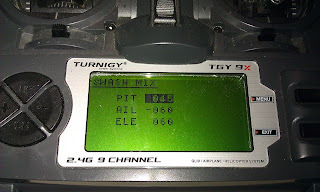 CENTER ALL STICKS, INCLUDING THROTTLE. Just noticed though if you center the throttle as well and when you get down to the next parts your pitch and center will be all out. If you pull the throttle back once all servos are centerd, you end up with all servos down 30o and you after all is done and throttle is 50% up all servos are central giving the HK450 still a negative pitch.. Hope this makes sence? 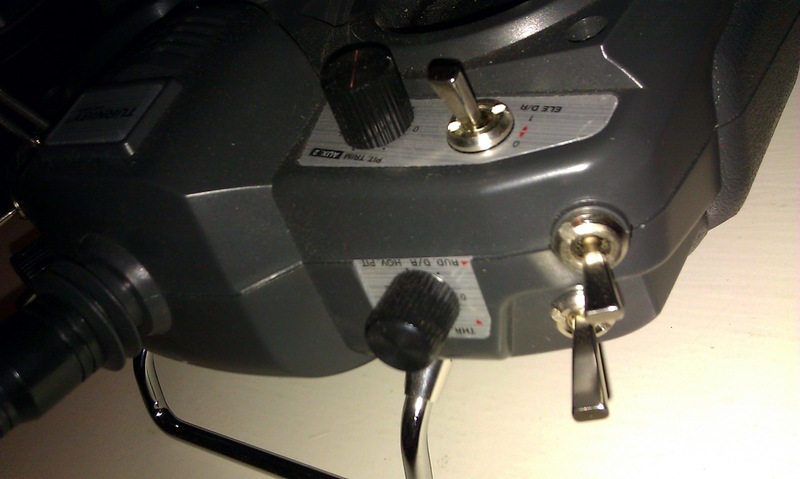 Initially, should you set up with throttle down before putting the servo arms to center? Good job mate. Say what do I do if my swashplate is not level. And only one servo is moving when I move the aliron stick? Good to get this kind of feedback. Many fun flight hours!